I know I’ve shared my obsession with fringe on here before. More often than not, fringe pieces (like skirts and dresses), sell out before I have a chance to snag my size! This time I was on top of it though. I spotted this skirt last week and wasted no time in ordering it in both black and white, and in two sizes each just in case! Even though a statement skirt like this one is trendy, it’s also something that will stand the test of time. Not just because it is a solid color and a classic silhouette, but because it’s fun! It’s one of those pieces that will always put a smile on my face. Something else that puts a smile on my face? Finding a steal. 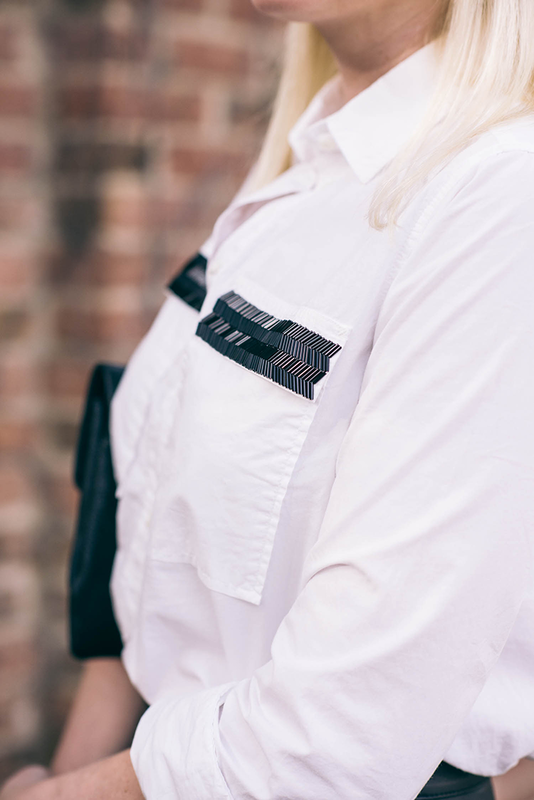 I’ve been eyeing this J.Crew shirt (also available here) for months, but just didn’t think it was worth spending over $100 on. No, it wasn’t that expensive, but I just couldn’t pull the trigger for some reason. That is until I walked in the new J.Crew in West Village and found this shirt marked down to final sale. It was an additional 40% off the sale price, making it a whopping $20 total. Hell yeah, I’ll buy that! While it’s not quite that cheap online, it’s still a great steal. Anything this cute and that cheap is always worth taking the plunge. A few other pieces I found in the J.Crew sale section include this classic leather tote (love the warm taupe and stone blue shades! ), this long-sleeve striped tee, and this pinstripe swing skirt. Don’t forget about the jewelry! That skirt is a beauty, you look gorgeous Merritt. I cannot believe that skirt, what a major score!! LOVE! That skirt is bananas and I LOVE it! awesome story about that button up! Love it when that happens:) Also, love the entire look. 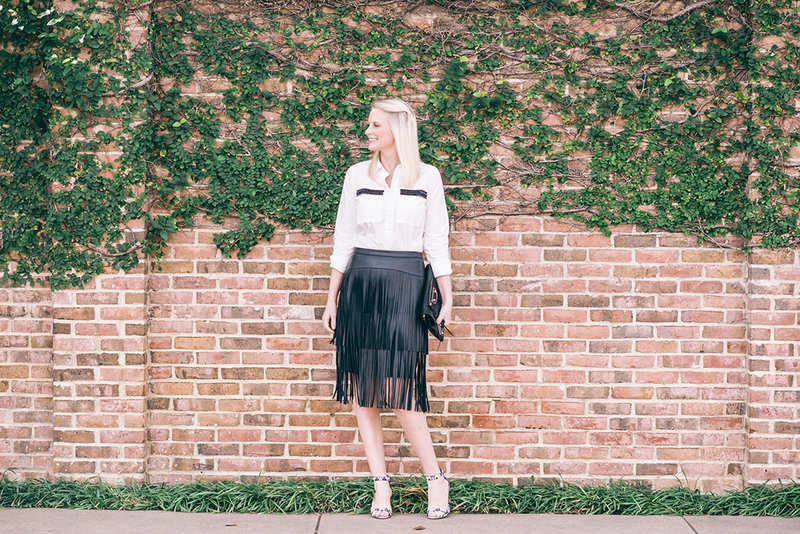 That is the perfect fringe skirt, bc, like you said…it is fun but also classic. I think its the way you styled it that makes it so classy and striking. That skirt is amazing on you; it’s such a cool statement piece although every single thing you’re wearing today is on point! Oh my goodness! I LOVE this skirt! So pretty! Wow – that skirt is such a statement piece! Great find! I’m loving that skirt and how you kept everything else very simple and classy. love it! What a steal for the top! I’m sorry, a fringed leather skit??!! AMAZING. I could never pull this off, so thank you for letting me live vicariously through this post! Incredible look Merritt! 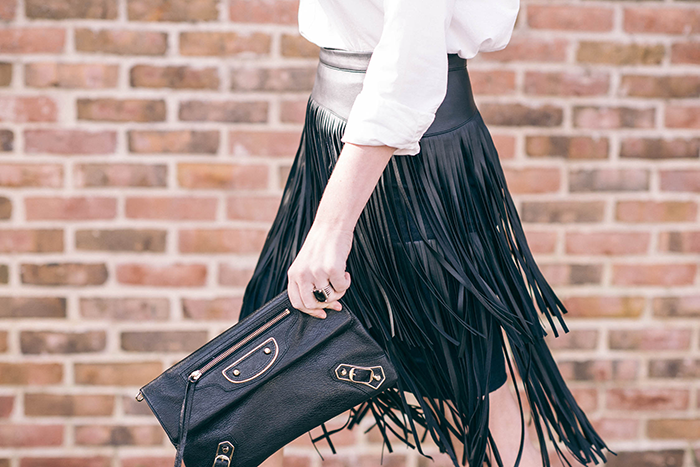 Loving this fringe skirt! It was exactly the same for me, couldn’t pull the trigger on the shirt at the regular price but then found it for $20 something and it was a no brainer :) Absolutely love how you styled it! Great find with that skirt! Love it and love the fringe as well! Ahhhmazing skirt! The pictures are great because they really capture the movement. I saw that shirt on sale and almost bought it. Wishing I had! What a great find! I love a sale. The skirt is cool, wait to see you see my fringe post for rodeo! You’re going to love it. I have been seeing so much amazing fringe lately! It looks so fun when you dress edgier! Great minds think alike, this skirt just arrived on my doorstep today! For some reason, not on sale, it was half the price for the exact one on Neiman Marcus. You styled it beautifully! That fringe skirt is fantastic! And I love the shoes! How can you not just want to spin constantly in that skirt. Love, love, love! Fun outfit! Those shoes are great! Such a chic skirt! Love how you styled it! girl! this skirt is amazing! I need one!